Dog Walking – Stay Clear! As a professional dog walking company – we see it all. There’s no bigger pet peeve for a professional dog walker than people who walk their dogs off-leash, or insist on coming up to you and your dog to “just say hi.” Sorry to say – we don’t want to say “hi.” We’d like to say “stay away” we’re working with a sensitive dog or a dog-in-training. You’ve heard the adage: “A picture’s worth a thousand words.” How about seven? The Yellow Dog Project is an attempt to give a visual cue to other’s to keep their distance. 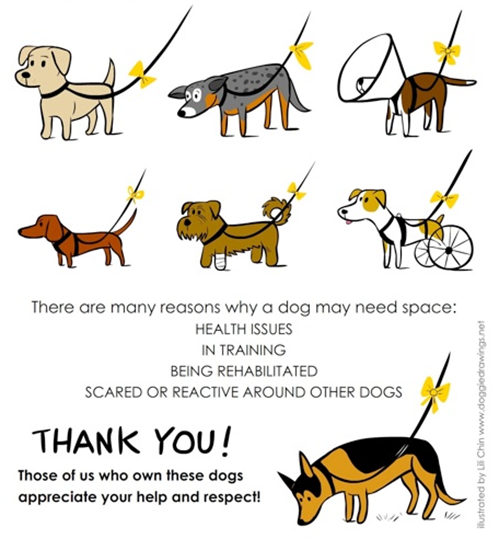 The idea is to tie a yellow ribbon to your dog’s lead to signal others that your dog is working. See the seven pictures below in their infographic poster. Check out their idea by visiting their website!